So ComReg paid a lot of cash for a report on subloop unbundling in Dublin and it paints a dire picture for the future of broadband in Ireland. The idea of subloop unbundling is that instead of having equipment in an exchange, the equipment is in those tiny cabinets in the estate or in the basement of an apartment complex and VDSL which is like higher speed DSL will then bring you broadband on your copper lines. It’s like bringing fibre closer to the home but not completely there. 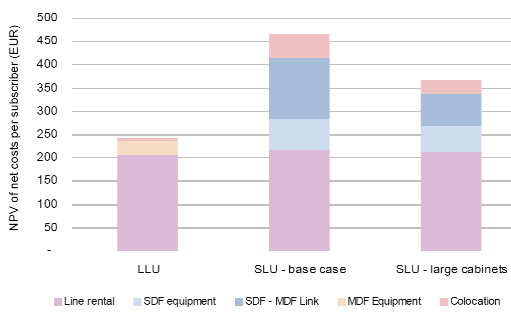 The largest costs faced by OAOs in deploying SLU are the charges for line rental, co-location at the street cabinet and the backhaul link to the MDF. In all three cases, it seems unlikely that competition will provide lower prices than those available from eircom. Therefore, the possibility of obtaining a fair price from eircom for these services will be important if OAOs are to be encouraged to deploy SLU. Remember line rental for LLU is 14.67 a month. Ripoff expensive. Then there’s paying to get to those small cabinets and if eircom doesn’t share em, you might have to build your own. Planning permission nightmares. The report tries to be positive but if you read it yourself you’ll see that they’re actually say NOT A CHANCE. Given that the business case for SLU in the Dublin area is challenging, we believe that the business case will be difficult in other areas of Ireland, where the line density per cabinet is likely to be lower and the backhaul costs greater. Given ComRegâ€™s responsibility to promote competition, it should now be considering how best to remove potential barriers (including supporting processes) to a successful deployment of SLU. The component prices for SLU should be reviewed, both in absolute terms and relative to LLU. It will be important for there to be a flexible and competitively priced wholesale bitstream product in addition to SLU. Though eircom is planning to offer unbundlers adjacent co-location at its street cabinets, it will be important for OAOs to have access to eircomâ€™s cabinets, since the installation of duplicate cabinets is likely to be uneconomic and/or suffer from other constraints such as local planning. ComReg should consider ensuring that eircom offers co-location space in its street cabinets. Further work should be carried out to establish the magnitude of the cost to eircom of deploying cabinets large enough to accommodate unbundlersâ€™ equipment. It will be important for OAOs to have access to an affordable, fibre-based, backhaul product from eircom as it would uneconomical in most cases for OAOs to replicate this infrastructure. Options for such a product include duct access, dark fibre or Ethernet products. This entry was posted on Thursday, January 24th, 2008 at 4:43 pm	and is filed under business, irishblogs. You can follow any responses to this entry through the RSS 2.0 feed. Both comments and pings are currently closed. But is it also not perfectly obvious that the OAO ( other operator) would have to pay the full whack of â‚¬14.67 a month for the reduced fraction of the copper loop as well , no discount there people . Nor was there any rebate to the OAO for the gear that they would have stranded in the old exchange while the exchange kinda fecked off to these cabinets . At least Comreg had the decency to pay â‚¬600k cash to a pack of consultants to do the dirty work for them. Now they can blame these foreign chappies for their own incompetence and not eircom or Comreg . That what I call value for money ! Looks like Eircom have done a very neat end-run around the toothless regulator — *again*. The only useful response I could see would be for Comreg to block VDSL in this form from going ahead, but how likely is that? You think comreg is in a position to stop eircom from delivering 25 Mbps services to customers? That would be politically unwise and also very illegal. What did you expect? This is the nature of the fiber-to-the-kerb business in a country full of spread out single-dwelling houses. You can’t expect there to be an awful lot of players. The infrastructure is just too expensive to roll out.